Estructura de los sonidos del espaÑoloffers students of Spanish a comprehensive introduction to the phonetics and phonology of Spanish. While assuming no prior study of linguistics,Estructura de los sonidos del espaÑolguides students to investigate in depth the functioning of sounds within the language system. Simultaneously, the book and the fully integrated online practice environment bring together all the elements necessary to achieve significant progress in the acquisition of Spanish articulatory habits.Estructura de los sonidos del espaÑolincorporates recent advances in the study of Spanish phonology and builds progressively in content complexity to provide a balance of theoretical and practical content in an accessible and engaging format. 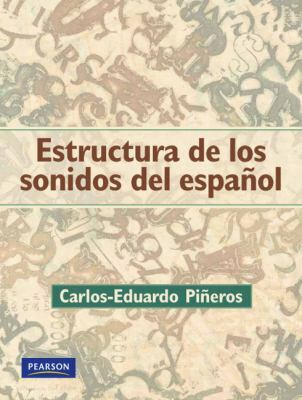 Features Clear explanations and detailed illustrations Abundant individual and group practice Strict adherence to the International Phonetic Alphabet Fully integrated voice recording and feedback capabilitiesPiñeros, Carlos-Eduardo is the author of 'Estructuras de los Sonidos del Espaol', published 2008 under ISBN 9780131944374 and ISBN 0131944371. Loading marketplace prices 9 copies from $3.25 How does the rental process work?